This one begins with my frustration with the poor rechargeable battery performance in most Canon point-and-shoots using two AA size batteries. Canon cameras that use two AA batteries seem to be pretty much useless with normal NiMH rechargeables, as they last for about 10 shots or so, if you are lucky – that’s because they produce only 2.4 V.
Solution: Use a single LiFePO4 3.2V AA cell coupled with a dummy cell. 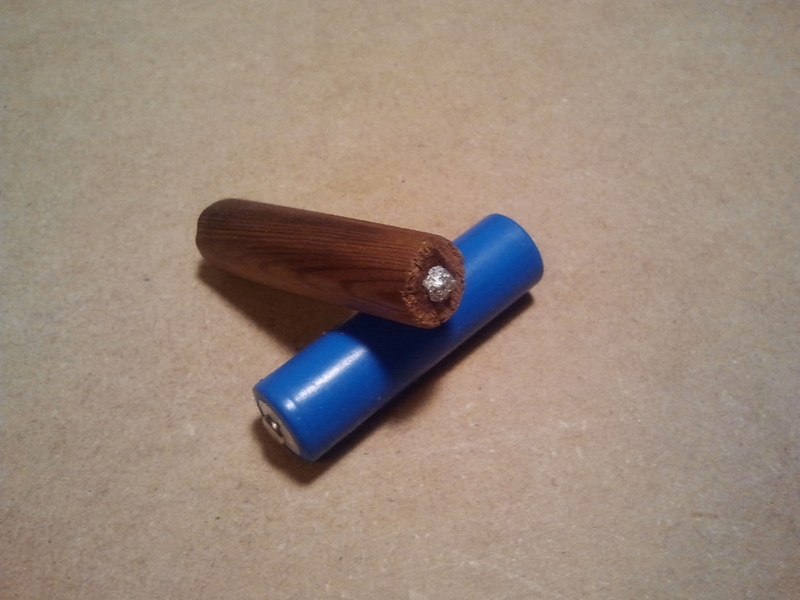 The dummy cell is just a chunk of wood filed down to be cylindrical and the same length as a AA cell. A hole is drilled down the center and a 2″ long wood screw is screwed in. 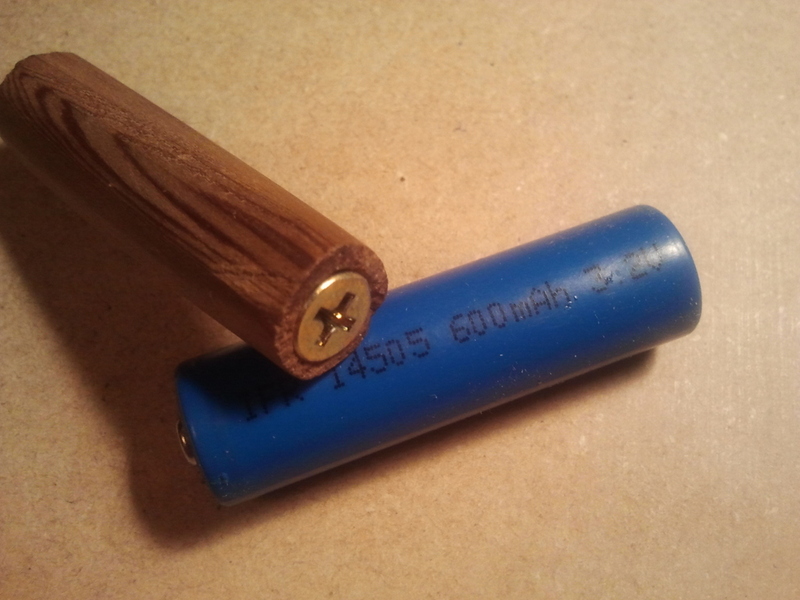 The end of the screw would be ground down, as it is usually too sharp to put into the battery enclosure. One can also put a small amount of crushed aluminum foil over the end of the screw so that it fits nicely in the battery enclosure. Although LiFePO4 batteries are safer than most Lithium-based batteries but this comes at a price: About half or third the power capacity. Fortunately, because they hold their voltage well over their discharge cycle, this isn’t a big problem on cameras. Plus you can carry extra as they are light and you only need one when in the past you needed two! Most important – there is a small chance that the slightly higher voltage of the cell compared to Alkalines could damage your camera. If you are concerned about this, do not take the risk. I have tried this successfully with two different Canon models with no ill effect. But, I am not responsible if you destroy your favorite camera! You have been warned. If you put two of these lithium cells in your camera, you will destroy it, thus, the need for a dummy cell. Since the cell is blue with no obvious markings, it is pretty easy to tell if you are about to do something stupid. And, you should not use them in equipment (i.e. anything other than a camera) that could discharge them below their minimum rated voltage otherwise their life could be significantly shortened. This is not a problem in cameras as they usually cut out before that point is reached. I can confirm this because I’ve been swapping the same two cells back and forth since mid-2009 and they are still as good as the day I got them. The cells are only $1.95 each, but you’ll need to purchase a special charger which will run you about $20. Get at least two cells for quick swapping. Many people commented on this hack. The most significant comment was that there are now NiMH batteries that don’t have the problems of the old, mainly the self-discharge problem. But also, some older Canon cameras like mine seemed to have problems with low voltage operation whereas new ones don’t. Also, some people were concerned about the lack of protective devices in this cell – a concern, but it appears that realistically is only an issue if the cell is misused. Others thought it would be safe to eliminate the dummy cell and wire up two cells in parallel to get double to storage. This may actually work without modifying the camera, but at the expense of some cabling and insulation trickery. Conclusion: If you use proper NiMH and a quality charger, you get safety and performance, but if you have a camera that doesn’t like any NiMH cell, the LiFePO4 approach may be your way out. I’ve also added a picture of my charger at the bottom, which I purchased from the link above. If you put a Diode in the dummy voltage goes down by 0.7 Volt to prevent overvoltage. That’s a pretty good idea – I may try that and see how much it affects time between recharges. why not put 2 of them in parallel? That would require rewiring the camera. Not sure about these batteries, but certain batteries should never be hooked up in parallel as they will self-discharge each other due to slightly different voltages. Might be worth researching (i.e. trying it with a couple a spares), because that would increase the max number of pictures you can take. I don’t think that would be a problem in this application. If your power’s path of resistance to one battery is greater than to the other battery, and you’re draining at a high rate(close to the batteries max amperage), then you can drain one battery a little faster than the other, which would result in different voltages in each cell, which would, in turn, cause a balancing current to run between them to top off the one that was drained faster. You could probably make a 2 cell battery pack work without modifying the camera, if you wire the two cells in parallel, and cover and bypass the connectors on one cell. Just make sure whatever you are using to insulate the connectors doesn’t wear through, or you’ll short out your batteries and could have a real mess on your hands. Nice work, on the mod. Thanks for sharing! You have some good points. Since I haven’t tried the parallel cell approach, I can’t recommend it – still worth looking into, maybe under controlled test circumstances first. Anyway, this is still a nice Hack. I didn’t know there were AA sized LiFePO4 batteries! Thanks for pointing this out – I had not realized that NiMH technology has progressed this far in the last few years – now I’ll have to get some of these cells and compare performance! I thoroughly agree. LSD NiMH all the way for the Canon camera! I’ve got myself a cheap Chinese cells and even those do the job admirably. The old “Diode In the Dummy” trick… Actually, if you “had the room” the diode in the dummy trick could work for parallel batteries as well, just put two diodes, one from each battery in the correct polarity, that connect at the + terminal inside the camera. Boom, no discharge current, no “one battery feeding the other due to voltage difference” because then they can’t “see” each other. But… that would probably require heavy modification of the camera, or some weird external pack with dummies taking the place of ALL batteries, and a wire running somewhere… But this is still cool What do you use to charge that chemistry of battery? I’ve added a picture of my charging setup above. Notice I can only charge one battery at at time. It takes about an hour to charge. 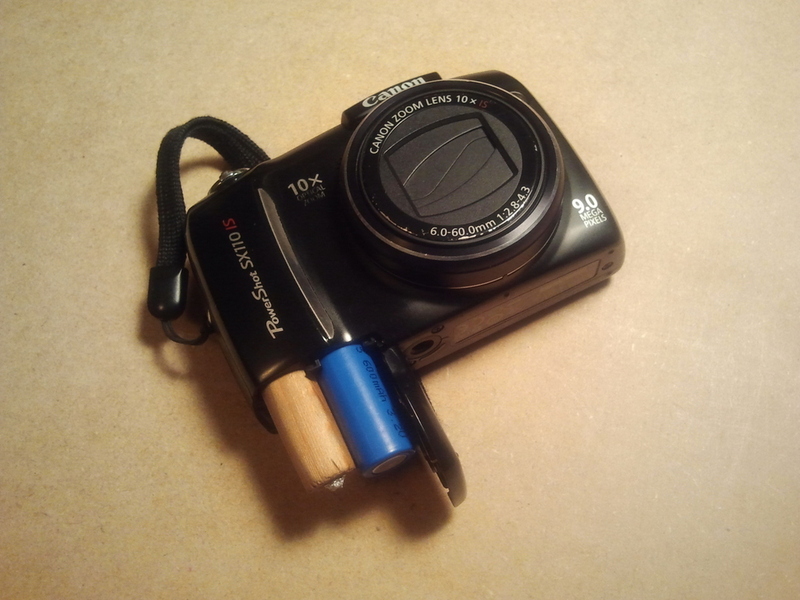 I tried this trick on a Powershot A720 IS, I got from a friend who said it was broke. Several NiMh ls I tried,was able to take 2 or 3 pictures, but all the time it said battery low. replace batteries. I’d say these Canon cameras have a design flaw being so critical about the battery voltage.It was probably designed for NiCd use. Now this hack is awsome! worked for me! The problem with Canon cameras using NiMH batteries is in the way that the battery “life” is detected. 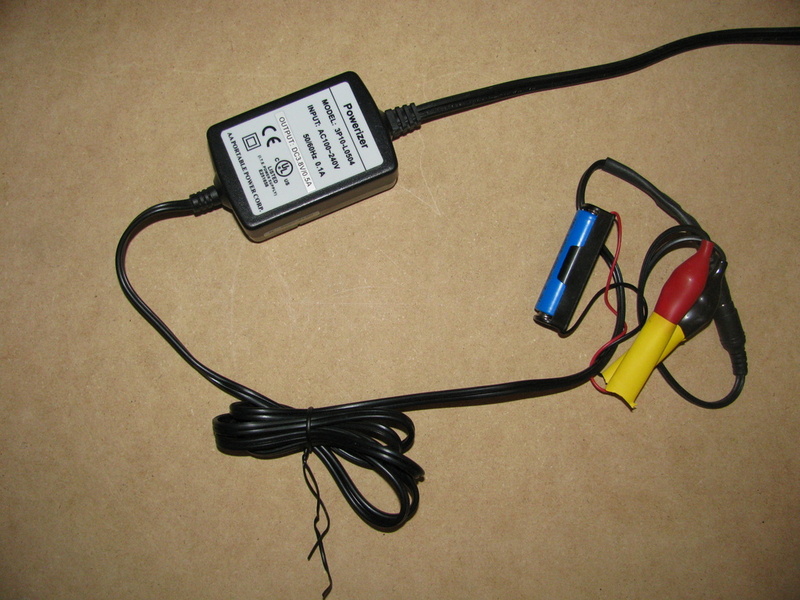 Most chargers will charge a NiMH to the initial battery voltage of 1.4V, not the 1.2V indicated on the case. Only after the first 15% of its discharge cycle will the battery terminal voltage will be nominally 1.2V. New alkaline batteries also have a rapid initial voltage drop before they reach a more or less stable plateau. It appears that the Canon cameras using AA cells detect the cell voltage when the camera is first turned on, and afterward, either look for the voltage to be above some absolute voltage, or measure the time for the camera to recharge for the next shot. Having measured alkaline and NiMH cells that the camera said were “low”, the alkalines had higher terminal voltages than the NiMH cells. Replaced in the camera, the “low” 2500 mah rated NiMH cells delivered more than 70 flash shots before the camera said “change batteries”; the “low” alkalines only 5 shots. From the specifications provided with my Canon camera for shots available per charge using Canon’s NiMH cells and cells (400 CIPA standard), and the mah rating of those cells, I can only conclude that Canon’s batteries are similar to Enerloop, with lower internal resistance, less self-discharge and faster recovery times. That would go a long way toward explaining the high price of Canon AA NiMH batteries. As it is, I’m satisfied with getting 70 consecutive flash shots in a single session (many more when shot in more sessions) with very inexpensive NiMH batteries. A professional might need more, but then, a professional probably wouldn’t be using cheap AA’s. BTW, a way around the cell limitation if your camera has an external adapter jack is to make up a battery pack of parallel-series arrangement of AA’s and a current-limiting resistor. Three NiMHs in series produce an initial voltage of 4.2V, drop to 3.6V. With a 1N4004 diode in series that could produce 3.5V – safe to use with my Canon’s nominal 3.15V external jack. A diode bypass switch could bring it back up to 3.6V once the camera indicated low battery. Add a second parallel string and you could shoot all day without changing batteries.